Camps, A.; Corbella, I.; Torres, F.; Vall-llossera, M.; Duffo, N.
The European Space Agency's Soil Moisture and Ocean Salinity (SMOS) mission will be the first one using two-dimensional aperture synthesis radiometry for Earth observation. This study presents the formulation that relates instrument observables and brightness temperature maps including cross-polar antenna voltage patterns, which may be also different from element to element. Finally, the radiometric accuracy degradation if cross-polar patterns are neglected in the image reconstruction is studied. 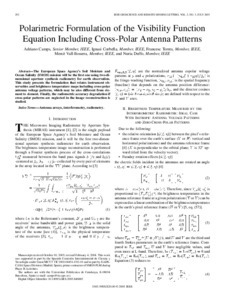 Camps, A.; Corbella, I.; Torres, F.; Vall-llossera, M.; Duffo, N. Polarimetric formulation of the visibility function equation including cross-polar antenna patterns. IEEE Geoscience and remote sensing letters, 2005, vol. 2, núm. 3, p. 292-295.